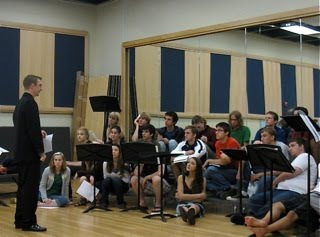 Ben went to Davis Senior High School, where Karen Gardias is the director of the Madrigal Singers. Davis has been involved in our award-winning (we may now proudly say, thanks to Chorus America) education programs for 17 years. This summer the Madrigal Singers will travel to Europe and perform in the Vatican as well as compete in the Eisteddfod in Wales which they won in l986. Ben took the occasion to talk to them about the Victoria Ave Maria which they will sing in Rome and the particularities of Spanish baroque - particularly pronunciation. He then gave a class on English Renaissance music ( since that's what we're singing now) with the objective of giving them, as he said, 'musical superpowers.' 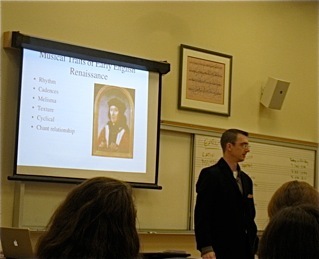 By that he meant the ability to distinguish between the phases of the English renaissance by the traits of the music.